Yes, it is once again Kwanzaa time! Time to eat benne cakes, roll out the Mkeka, set up the Kinara, light the Mishuma Saba, pass around the Kikombe Cha Umoja, and reflect on the Nguzo Saba! Kwanzaa is not a Christmas substitute for African Americans…Kwanzaa doesn’t have anything to do with Christmas at all. Kwanzaa is not a religious holiday. Kwanzaa is not about religion! If that is what Kwanzaa is not, then what is it? Well, it is easy enough to explain. Kwanzaa is the African American Festival that occurs at the end of the year. It was originally created by Dr. Mulana Karenga in the late 1960’s. Why have an African American inspired celebration? 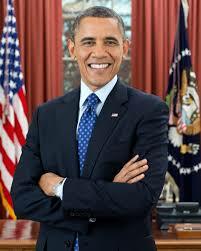 African Americans have been an integral part of the history of America since the beginning. Despite that, there are no national celebrations that recognize the contributions of African Americans to our country. There have been and still are AfricanAmerican inventors, soldiers, entrepreneurs, cowboys, farmers, firemen, and America even had a black president. In the ’60’s and all through my childhood, as a matter of fact, there was no acknowledgement that African Americans had much impact on the country at all before Martin Luther King was born! Kwanzaa has two main components that encourage celebrants to consider their place in the world as well as reflect on the contributions of African Americans. The first is the Nguzo Saba, and the second are reflective readings. Kwanzaa is a truly American celebration. it is based on First Fruits celebrations in different parts of Africa, but it is not like any of them. So, That’s as much history as I’m giving! Now, on to the steps! First you need a mat of some sort of natural fibers. MKeka (M-ke’-kah) – this mat is the foundation of your Kwanzaa display and it is the foundation that we use to build our lives. It represents the African American culture and traditions. 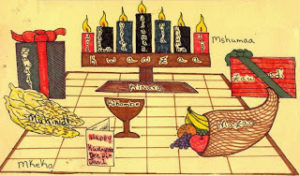 Mishuma Saba (Mish-oo’-ma So’-bah) – The candles. Three green, three red, and one black. These are the colors of the African American Flag. The red is for the blood we all share no matter where our ancestors were born, the green is for the hope of new life and a better world, and the black is for the color of the African American ancestral heritage. Kinara (kin-are’-ah) – The candle holder. The proper way to set up the Kinara is to put three red candles on the left, three green candles on the right and the black candle in the middle. You light the black one first. On the second day you light the red one. On the third day you light a green one. You continue to alternate between red and green for the remainder of the festival. Muhindi (moo-hin’-dee) – These are ears of corn, there should be one for each child in the home. The corn should be dried. Mazao (mu-zow’) – These are fruits and vegetables added to the Mkeka that represent crops, the bounty of the earth, good things and plenty. Kikombe Cha Umoja (ki’-cOm’-bA chah’ oo’-mO-jah) – The unity cup. We drink communally from this cup as well as pour a libation for the ancestors. Honoring the ancestors, those who came before us is an important aspect of Kwanzaa. Now that the Mkeka is set up it is time to get on with the celebration! 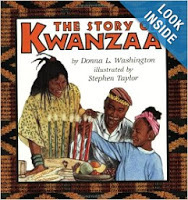 You can give Zawadi, (zu-wo’-dee), which are small presents, typically handmade, but they can also be things like books, but gifts are not the main thrust of Kwanza. We begin our Kwanzaa day with the words, Habri Gani! (Hu-bar’-ee go’-nee). It means what’s the news? The answer is the principle or Nguzo Saba of the day. 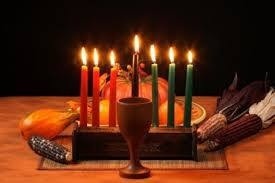 So what are the seven principles of Kwanzaa? Here they are. Kujichagulia (coo’-gee-chah-goo-lee-ah) – Self-Determination. We must not let anyone else decide who we are. We must speak for ourselves and not let others speak for us. Just because someone says you are lazy or useless or worthless does not mean it is true! Ujima (oo-gee’-mah) – Cooperative Work and Responsibility. We must work together to build the world of which we wish to be a part. We must look after each other and understand that we are responsible to ourselves, our families and our communities. Nia (nee’-uh) – Purpose. We must move through our lives with purpose and we must understand that our lives have purpose. Approach your life with goals and actions that help you achieve good things. Kuumba (k-oom-bah) – Creativity. Leave the world a more beautiful place than when you found it. Karamu (kAr’-um-moo) – The feast of Kwanzaa where you eat traditional African American foods, sing, dance, tell stories and celebrate! The last part of the celebration deals with reflection. You can do readings of African American artists, poets, teachers, and philosophers. You can discuss how you plan to make the Nguzo Saba a reality in your life. You can talk about what you have done in the past year to live up to the principles of Kwanzaa. That bit is up to you. Here are some readings to get you started. So, get out there and see if you can find a Kwanzaa event! Reflect on what you can do to make the world a better place.